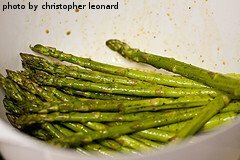 Place asparagus in a shallow roasting pan. Drizzle with olive oil. Sprinkle with salt and pepper. Toss to coat. Spread asparagus spears in a single layer and place in oven. Roast for 12-15 minutes or until fork tender. Can be served with Hollandaise sauce, Bearnaise sauce or as is. Preheat a large skillet on very high heat. In a small bowl, whisk together brown sugar, soy sauce, rice wine vinegar, ginger and flour. Set aside. Add the sesame oil and vegetable oil to the hot skillet. To the skillet, add asparagus, broccoli, snow peas, carrots, water chestnuts, red bell pepper and mushrooms. Saute until vegetables are warmed through. Using a spatula, move the vegetables to one side of the skillet. Pile the shrimp in the other side of the skillet and cook 1 minute. Flip the shrimp and then pour the soy sauce mixture on top of the vegetables and shrimp. Let sauce come to a boil and thicken. Toss everything together so that the sauce coats vegetables and shrimp. The shrimp will be cooked by this time. Remove from heat. Serve immediately over rice. Bring the chicken stock to a boil in a large pot. Cut the tips off the asparagus spears and set aside. Chop the remaining stalks into 1 inch pieces and boil in the stock for 15 minutes, or until very soft. While the asparagus is boiling, in a medium saucepan, melt the butter. Add the flour and whisk continuously over medium-high heat until lightly brown. Add 1 cup of the hot stock to the butter and flour mixture. Whisk together and continue cooking until smooth. In a small sauce pan, bring orange juice, lemon juice and sugar to a boil. Reduce heat and simmer for 12 minutes or until mixture is reduced by half. Add orange zest and balsamic. Mix thoroughly and remove from heat. Pour mixture into dipping cups. In a deep skillet, heat 2 inches oil to 350 degrees F.
In a shallow bowl, beat the egg. Add the ice water, flour, baking powder, salt and pepper and mix lightly until barely combined. Do not over-mix. Dip individual asparagus spears in the batter and fry in hot oil about 2 minutes, or until golden brown. Serve with dipping sauce. Melt the butter over low heat in a saucepan, set aside. In a mixing bowl, beat eggs and oil together until thick. Beat in the sugar. Stir in the melted butter and asparagus and set aside. In another large bowl, sift together flour, baking soda, baking powder, salt, cinnamon, nutmeg and allspice. Fold in the asparagus mixture. Then fold in the walnuts and raisins. Pour mixture into a greased 9x5 inch loaf pan and bake in oven for 65 minutes, or until toothpick inserted in the middle comes out clean. Let bread cool on a rack for 30 minutes before un-molding it from the loaf pan.